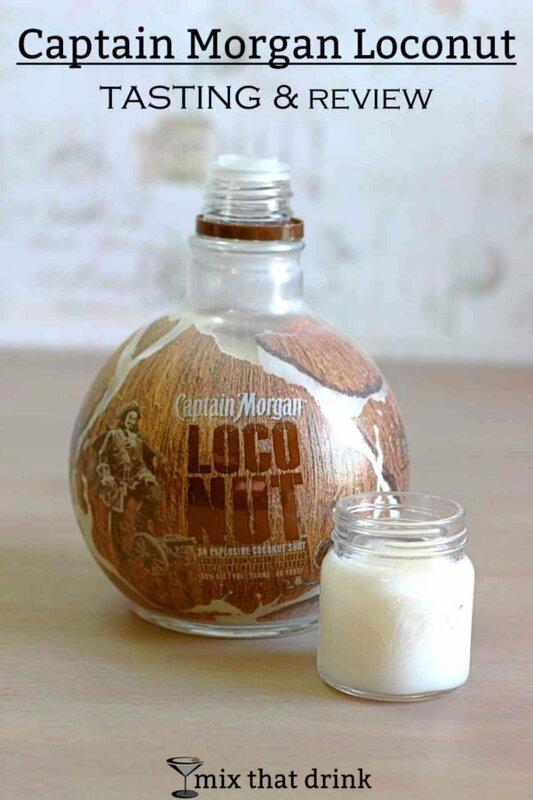 Captain Morgan has a new offering called LocoNut. They describe it as “an intensely delicious blend of Caribbean rum, coconut liqueur, spice and natural flavors.” They also note that it’s gluten free, and recommend you serve it chilled. 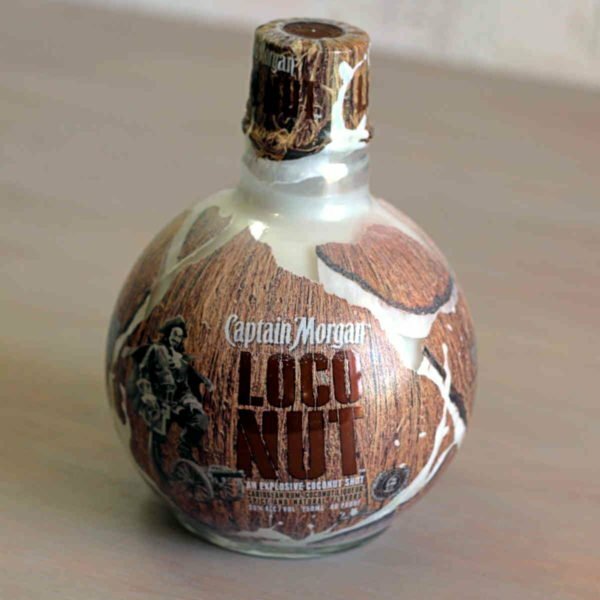 I recently received a free bottle of Captain Morgan LocoNut to try. See all Captain Morgan LocoNut recipes. Packaging isn’t important to the taste of a spirit, but it’s worth a mention here. The bottle is shaped like a coconut, with a label that looks like a broken coconut shell. And the design on it is actually coconut scented, designed to release fragrance when you scratch it. I mention this because it really sets the mood. Just picking up the bottle, it gave my hands the coconut scent and made me want to drink it immediately. But this is not your standard coconut rum. The strongest note is a refreshing coconut. But then you get the hint of spice, which tastes like something along the lines of cinnamon, cloves, maybe nutmeg or allspice. They’re not strong enough to compete with the coconut, though. It’s like coconut with a little something extra. Coconut with benefits. And there’s a richness to it, almost like coconut milk. This is an easy drink to fall in love with. I think you would have to hate coconut to not like it. It’s a deliciously powerful flavor. You may be wondering how it compares to Malibu and other coconut rums, but they really are two completely different things. Malibu rum is just straight up coconut flavor. And while LocoNut is mostly coconut, those hints of spice make all the difference. For drinking straight up, I honestly like LocoNut better. And that surprised me because I enjoy coconut rum – a lot. But this is something special. In cocktails, I think you could generally use this instead of a plain coconut rum. I can’t think of any cocktail it would ruin, and it would probably improve most of them. I tried the Loco nut on the rocks one evening and it was delicious. This is a wonderful liquor. Thanks for sharing this with the world! You’re welcome! I just love it. It’s also terrific with Kahlua and rum. I tried mixing it with mango juice and it was delicious besides the weird appearance. For some reason the coconut rum seemed to separate; it literally looked like shreds of coconut. Other than that it was awesome! That sounds wonderful! Did you shake it? It does tend to layer or separate if you don’t, but I haven’t had any problem when I did shake it. I LOVE this liquor, but as we neared the bottom of the bottle it seemed as though it curdled when mixed with other liquors. We mix coconut rum, pineapple run, and LocoNut over ice. It is amazing, but the last two times we did this, the white milkish part seemed to curdle. Any idea why? I’m not sure. I shook mine every time I poured it. I found it can curdle with some liqueurs if you don’t shake it with ice, but shaking with ice fixed it. A friend of mine suggested this devil brew! I wasn’t disappointed at all! While I’m not a fan of coconut this was spicy, smooth & had a very nice kick to it. I enjoyed this very plain, chilled in the freezer for 8 hours then over ice. Very refreshing and easy to enjoy. I mixed it with cola( the name brand) and something in the loconut mixed chemically with the cola horribly wrong. Kinda like s root beer float that has sat a bit. I’m not gonna waste the liquid below, however, I would note that even the coloring of the cola was stripped out of the liquid. (But it tasted great! Finished the bottle straight… didn’t want that into happen inside my stomach… lol. This stuff is delicious. Mix it with V8 Splash Island Strawberry and you’ve got a tasty beverage. I’m VEGAN and just saw a commercial for Captain Morgan’s LOCONUT liqueur. It looks very tasty. Other than coconut milk is there any other milk or dairy in the ingredients? It doesn’t list ingredients. You should write to the company and ask. Why does the Loco Nut curddle when I mix it with rum? Makes no sense to me. I wish I knew! Other people have reported it curdling with several things, and I’ve experienced it, too. It’s very frustrating. It is the coconut milk that is in it. Keep out of carbonated beverages! Different viscosity… its like oil and water. The coconut milk will curdle and separate. Anyway it doesnt really need a mixer. Delicious chilled!!! I’m enjoying Captain Morgan’s LocoCoco Rum for the first time this evening. Drinking it “on the rocks” & it’s delicious!! Perfect blend. Not one single ingredient overpowers another. I definitely think this would be perfect mixed as a Rum Colada, too. That will my next relationship with the lucious LocoCoco Rum. I am so pleasantly pleased with this one! I see by the dates of the comments that I’m late to the party, as usual. Went to a recently opened store the other day to buy some wine and to browse, and wow, the selection was incredible. I’m always on the lookout for a unique liquor, so when I saw the LocoNut bottle I was won over. My first taste sealed the deal. This is excellent! I was curious about reviews for this, so just now I googled it and found your site. I had no idea the label was scratch and sniff until I read your review. Well, that beats everything. I ran to get the bottle and started scratching and sniffing. Love that feature! Thank you for your excellent review. Now it’s time to explore your site. Glad you’re enjoying it! What a great start to your new year! Absolutely LOVE !!!! I hope it’s not just seasonal !!! I buy one every week. I drink it on the rocks. Love the bottle also. I would love the lid to be metal because I wanted to fill it with tiki lantern fuel & put a wick through the lid ( but cannot with the plastic lid ) & have some beautiful lanterns … hint, hint, hint, need a metal lid !!! !